The EC-5 delivers research-grade accuracy at a price that makes large sensor networks economically practical. You can adequately characterize your site with sensors at multiple depths and locations, even if you're on a tight budget. 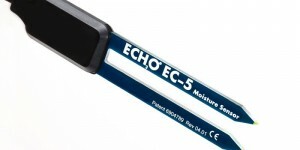 Just 5 cm long with a ~0.2 L measurement volume, this handy little sensor is easy to install in the field and can also be used in nursery pots. The EC-5's compact design makes it easy to push directly into undisturbed soil to ensure good accuracy.